mong the many good character traits of Wilbur and Orville that enabled them to work together productively was a sense of humor and the ability not to take themselves too seriously. In the summer of 1892, the firm of Wright & Wright received an order for one of their printing presses, and at the same time landed a big printing job with their brother Lorin Wright. At first they decided to split their efforts -- Orville would take care of the print job while Will built the press. When the print job fell behind, Wilbur left off press-building to pitch in. Later, a dispute arose over how to divide the payments for the two jobs and some harsh words were exchanged. To make his point and mend fences at the same time, Wilbur filed the following tongue-in-cheek law suit in the "Circuit Court of 7 Hawthorne Street," begging for a ruling from other family members. It's not known what the judge and jury decided, but the law suit achieved its purpose. It preserved what is generally agreed to have been one of the most creative and productive partnerships of all time. Circuit Court of 7 Hawthorne St.
1. And now comes plaintiff and says that he is a member of the firm of Wright & W'right, a firm doing a general printing and press-manufacturing business in the city of Dayton, Ohio. That Orville Wright the defendant is the other member of said firm. 2. 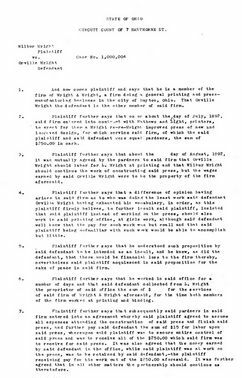 Plaintiff further says that on or about the day of July, 1892 said firm entered into contract with Mathew and Light, printers, to erect for them a Wright re-re-Wright improved press of new and improved design, for which services said firm, of which the said plaintiff and said defendant were equal partners, the sum of $250.00 in cash. 3. 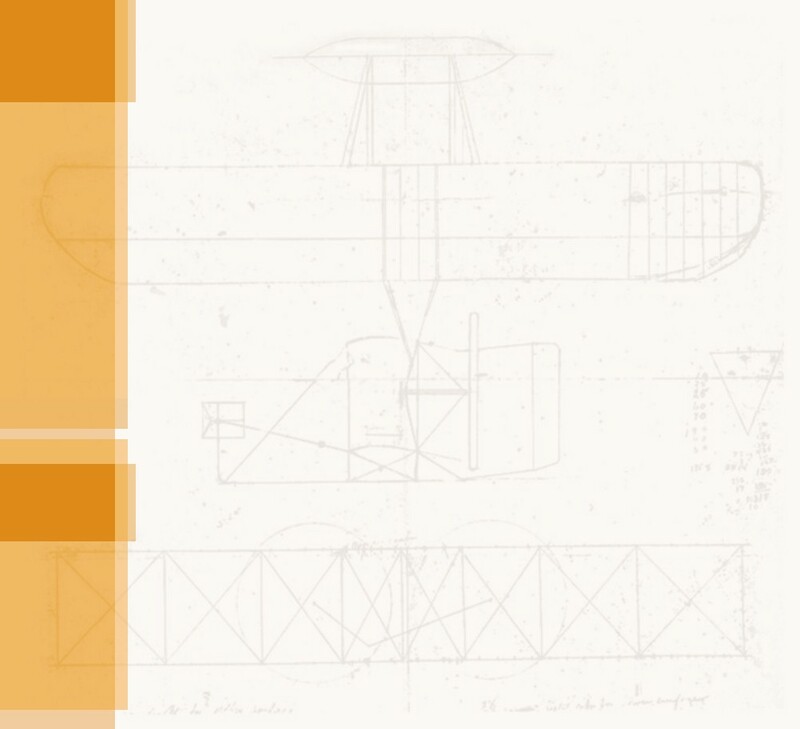 Plaintiff further says that about the day of August, 1892, it was mutually agreed by the partners to said firm that Orville Wright should labor for L. Wright at printing and that Wilbur Wright shouJd continue the work of constructing said press, but the wages earned by said Orville Wright were to be the property of the firm afore said. 4. Plaintiff further says that a difference of opinion having arisen in said firm as to who was doing the least work said defendant Orville Wright having exhausted his vocabulary, in order, as this plaintiff firmly believes, to further insult said plaintiff, insisted that said plaintiff instead of working on the press, should also work in said printing office, at girls work, although said defendant well knew that the pay for such work was but small and that said plaintiff being unfamiliar with such work would be able to accomplish but little. 5. Plaintiff further says that he understood such proposition by said defendant to be intended as an insult, and he knew, as did the defendant, that there would be financial loss to the firm thereby, nevertheless said plaintiff acquiesced in said proposition for the sake of peace in said firm. 6. 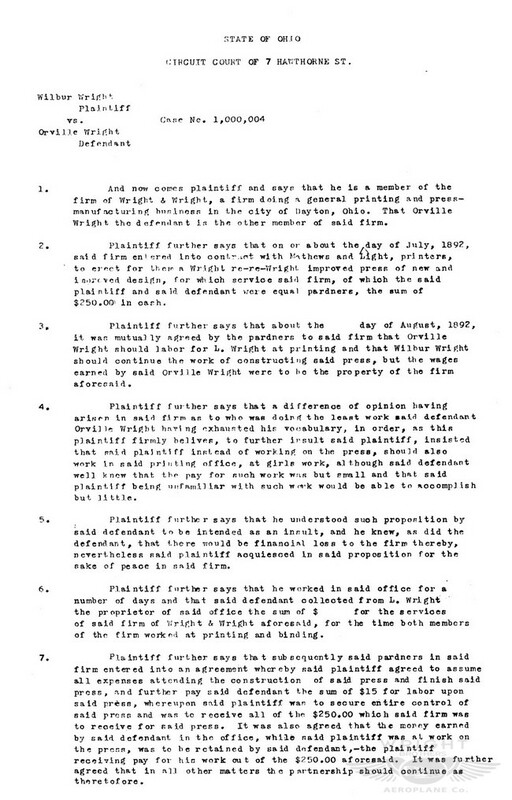 Plaintiff further says that he worked in said office for a number of days and that said defendant collected from L. Wright the proprietor of said office the sum of $ for the services of said firm of Wright & Wright aforesaid, for the time both members of the firm worked at printing and binding. 7. Plaintiff further says that subsequently said partners in said firm entered into an agreement whereby said plaintiff agreed to assume all expenses attending the construction of said press and finish said press, and further pay said defendant the sum of $15 for labor upon said press, whereupon said plaintiff was to secure entire control of said press and was to receive all of the. $250.00 which said firm was to receive for said press. It was also agreed that the money earned by said defendant in the office, while said plaintiff was at work on the press, was to be retained by said defendant, the plaintiff receiving pay for his work out of the $250.00 aforesaid. It was further agreed that in all other matters the partnership should continue as theretofore. 8. Plaintiff further says that when he demanded his share of the sum collected by said defendant for the services of the firm while both members worked in said office and work on the press was suspended, said defendant refused, although said plan had been opposed by said plaintiff and had been entered into, merely to afford said defendant an opportunity to insult said plaintiff and to taunt said plaintiff with the statement that his own services were being paid for at the rate of two dollars and a half & day, while only a few cents a day was being collected by said firm aforesaid for the services of said plaintiff; but said defendant proposed to settle on a basis of $2.50 per day for his own work and a few cents a day for the work of said plaintiff. 9. Plaintiff further says that while, as a member of said firm, he is willing to stand his share of the expense entailed upon said firm for the gratification of the pleasure of said defendant alone, nevertheless he is not willing that said defendant should have all the fun, and said plaintiff all the expense. 10. Plaintiff further says that he was first insulted, then cheated, and then accused of having a dishonest and tricky business character as instanced by his application for his share of the money earned by said firm, while the work on said press was suspended. Wherefore said plaintiff prays an order issuing out from this court directing said defendant to pay said plaintiff one-half of the money collected by him in behalf of said firm for work in office, while work on the press was suspended, and further prays an order directing said defendant to apologize for his insulting conduct, and requesting him to keep his mouth shut in future lest he should be again guilty of befouling the spotless and innocent character of others. 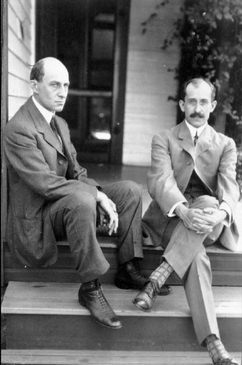 Still together after all these years -- the Wright brothers pose on the back steps of their home during the Homecoming Celebration of 1909. The first page of the "case" as Wilbur typed it.